At VMworld 2013 vCloud Air Disaster Recovery as a Service (DRaaS) was announced as something coming for VMware Hybrid Cloud. However, recently some people have asked for alternatives while we wait for that to become available. Disaster Recover to vCloud Air is a very attractive use case for a lot of people. What I want to touch on is an experimental thing I am trying this week that has a lot of promise. First we need to understand the requirements for what I am going to explain, and how you can facilitate it at a high level. First and foremost you need to first establish the “Hybrid” networking connections. There is both Site to Site VPN and what VMware has announced for Direct Connect. This is a key component as without the networking between source and destination we cannot do the next steps. In my lab I already have this connection established and networking functional. Deploy or migrate virtual machines you want to protect. Decide if you already have an on premises machine and you can deploy a new one in vCloud Air or make a copy of the existing one. The final key is to use a guest based replication technology. For my purposes I am using Vision Solutions Double-Take. You can use any guest based technology that communicates from source virtual machine to guest virtual machine. Why is this best with vCloud Air? First of all, the networking stack in vCloud Air with vCloud Networking and Security is easy to understand and setup with VPN. Also duplicating your current virtual machine with vCloud Connector is very easy with little to no changes required if you want to use that as a starting point. Depending on the third-party application you are using you may find it easier to copy your machine first then sync the source and destination. Because you are dealing with VMware machines on both sides the setup is quite easy. Additionally few people I have talked to are actually doing data center connections to AWS or Azure, and that connection is the foundation of the VMware Hybrid Cloud. Extend your data center first, deploy infrastructure, treat it like any other data center you have and solutions like this work very well. With guest based solutions you can pick and choose when and where an application runs in the various VMware vCloud Air locations. The interesting thing is connecting these locations together via VPN even to test it for a Proof of Concept is rather easy. In my case I did a full server copy from a Virtual Private Cloud to a Dedicated Cloud. 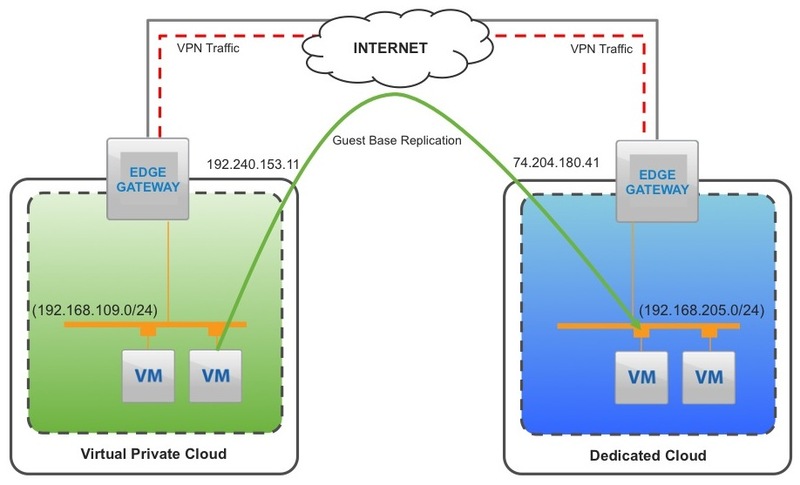 The replication worked perfectly dine when each server was added by IP Address because the two clouds were already connected and configured to allow traffic to pass between the networks. In the smoke test lab I don’t have a full domain or DNS running, but I wanted to prove to myself that this works. I will take this to another level be having some Domain based machines and using DNS updates to provide the change to allow access to the files or services. The REASON it works is by leveraging the power of the vCloud Air networking and inter-connectivity between clouds and on premises. At the end of the day this looks no different from running guest based replication across physical sites or using it within the same VMware Hybrid Cloud virtual data center. Are you already a customer of Vision Solutions or another guest based replication technology? If you are maybe you want to get a small Virtual Private Cloud and give this a go. For a larger test I will want to fully configure and map out the network connections needed as you cannot use the same NAT address ranges for VPN to work so I will need to figure out the details for the connectivity since the source and destination machines have different IP addresses. I will need to read up more on the Double-Take solution, but I think that can be solved with DNS once I have a larger lab setup running I can work on a full paper to show a functional solution. This initial test was to validate connectivity and replication between the two machines, and show it can be a viable solution and it works just fine as diagramed above. So what do you think? Something worth trying yourself? I will plan on taking this further potentially with the more real test I just need more time to set up more lab gear!